Our newsletter, The VOTER, provides information on League programs and events. 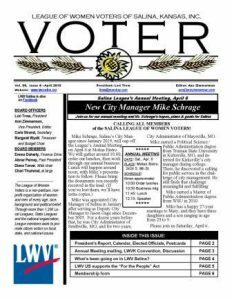 View the April 2019 issue of “The VOTER,” produced by LWV of Salina. Put the Salina Annual Meeting and the State Conference on your calendar. 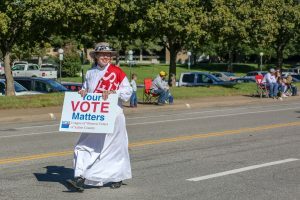 Read about the LWV and Women’s Right to Vote 100th Anniversary Celebration starting this summer. Find out about the latest Lunch and Learns. Looking for past issues of our newsletter? Please check the LWV Salina newsletter archive. Suggestions or feedback on our newsletter? Please send your email to our newsletter editor.